RE: EBR 012-8104 Amendments to wolf and coyote hunting and trapping seasons under the Fish and Wildlife Conservation Act in response to amendments to Ontario Regulation 230/08 (Species At Risk in Ontario List) under the Endangered Species Act, 2007 for Algonquin Wolf. Thank you for this opportunity to comment on the Ministry of Natural Resources and Forestry (MNRF) proposed amendments to the Fish and Wildlife Conservation Act in response to the legal listing of Algonquin wolves as Threatened under Ontario’s List of Species At Risk. We are encouraged that the MNRF has proposed additional closures for both wolf and coyote hunting and trapping, in line with research that shows there is overlap in the morphological attributes for these animals and their hybrids (Benson, Patterson and Wheeldon 2012; Sears et al. 2003), and therefore the species cannot be distinguished without a genetic assignment test (MNRF, and see Rutledge et al. 2010a). However, we emphasize that the three proposed closures are inadequate to recover the Threatened Algonquin wolf population and urge that more protective measures be taken immediately. 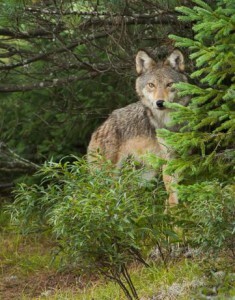 In order to implement the required protection outlined in the Endangered Species Act for threatened populations, and to effectively increase the probability of recovery for the Algonquin wolf population, wolf and coyote hunting and trapping must be immediately banned in all Wildlife Management Units (WMU) that contain any portion of the Algonquin wolf’s extent of occurrence (as described by the Committee on the Status of Species at Risk in Ontario (COSSARO 2016). These WMUs are: 35-39, 41-61, 75 & 76A. We recommend that these closures should be additive to the existing protection in and adjacent to Algonquin Provincial Park. Given the vagility of these animals, these closures are conservative. Anything less than this is a blatant disregard for the recovery of this at-risk wolf population.  Algonquin wolves will not be able to disperse due to hunting and trapping outside of the “core occurrence areas”. Dispersal is a natural process that is important to survival and recovery.  Hunting and trapping outside the “core occurrence areas” will disrupt the social structure of Algonquin wolves residing within the “core occurrence areas” and jeopardize their survival and recovery as functional packs within the protected areas.  Connectivity between the “core occurrence areas” is too restricted.  There is a high risk of hunting and trapping of wolves outside the “core occurrence areas”.  Algonquin wolves, coyotes and their hybrids are exposed to poaching and vehicles during dispersal from protected areas, also putting their survival at risk.  ‘Baiting’, ‘hounding’ and ‘calling’ are common methods used by hunters to kill wild canids. These activities essentially facilitate a ‘forced dispersal’ outside of the suggested “core occurrence areas”.  The “core occurrence areas” are too small to sustain viable wolf populations.  Climate change is impacting the environment in unpredictable ways; numerous predator and prey species are being forced to alter their ranges and adapt to habitat disruptions. Limiting the hunting and trapping ban to three small “core occurrence areas” will likely not allow Algonquin wolves to relocate as needed if weather patterns, sources of prey and habitat changes dictate the necessity. The Ottawa River poses a significant geographic barrier to this threatened species. To preserve Algonquin wolves and allow for gene flow to populations in Québec, as well as protected areas north of their extent of occurrence (e.g. Lake Superior Provincial Park, Chapleau Crown Game Preserve), we recommend that wolf and coyote hunting and trapping is also closed in the following WMUs: 28, 29, 31-34 & 40. We have chosen the WMU as the unit for closures, in lieu of townships, as the WMUs have more biologically relevant boundaries and enforcement at this level is simpler given the existing maps made available to the public. In all cases, the closures must be year-round, as dispersal times vary for individual wolves. In support of the closures we have outlined, we document the positive benefits to the Algonquin wolf population and local economy following protection implemented in townships adjacent to Algonquin Provincial Park (APP), and scientific rationale outlining why the three proposed closures are insufficient to protect Algonquin wolves or lead to a population recovery of this unique species. 1. Wolf and coyote killing ban in Algonquin Provincial Park and adjacent townships. a. The wolf density inside the park stabilized almost immediately following the ban in 2001 (Theberge and Theberge 2004, Rutledge et al. 2010b). Widespread culling of the park wolves in the 1960s was responsible for introgression of coyote genetic material (Canis latrans) into the park wolf population (Rutledge et al. 2011). Therefore, despite many years of culling, the park’s canid population was likely saturated, supported by evidence showing that packs of wolves, coyotes and hybrids were found to be spatially segregated within the park (Benson and Patterson 2013). This explains why the wolf population did not increase significantly following the hunting and trapping ban. While the stabilization of Algonquin wolves within Algonquin Provincial Park is a measure of success, it is not adequate to allow for dispersal, nor full species recovery. c. The protection zone is associated with a larger proportion of Algonquin wolves relative to other canids (Benson et al. 2012, Rutledge et al. 2010a) and some data suggest that Algonquin wolves may be able to exclude and/or displace eastern coyotes (Patterson pers. comm.). d. The Park wolves are world-famous and contribute positively to the local economy, having attracted over 167,000 people from all over the world to the Public Wolf Howls that take place in August, 4 times per year. Wolf ecotourism contributes a significant amount of money to the local economy around Algonquin and Bonnechere Provincial Parks, offsetting the potential economic effects of reduced hunting and trapping. 2. Proposed closures around Killarney Provincial Park (KPP), Kawartha Highlands Signature Site (KHSS) and Queen Elizabeth II Wildlands (QEIIW) are insufficient to recover the Algonquin wolf population. COSSARO described the extent of occurrence for Algonquin wolves using single record locations for confirmed individuals. Approximately one third of the records of individual locations found outside of existing protection in and adjacent to Algonquin Provincial Park fall outside of the proposed closure areas. a. Search effort has been minimal and limited outside of provincial parks; there may be as-yet unidentified clusters of Algonquin wolves that have successfully established beyond the parks, for example where human access (via roads etc.) is low enough and moose density is high enough to allow persistence despite ongoing hunting and trapping at a coarser scale (see Benson et al. 2014). Continued hunting and trapping of wolves outside these areas could prevent dispersal and recovery of Algonquin wolves. b. The most recent surveys have found sparsely distributed Algonquin wolves along the periphery of the extent of occurrence, suggesting that the currently described extent of occurrence is a conservative estimate. For example, the most recently identified Algonquin wolves have been recorded near Sault Ste. Marie and Minden. c. The proposed closures encompass a small portion of the complete extent of occurrence. This would provide inadequate protection for a species with large territorial requirements. In addition, this would limit dispersal and could potentially lead to in-breeding ingression. d. Algonquin wolves, coyotes and their hybrids are wide-ranging animals. The records used to create the extent of occurrence polygon are single locations that do not accurately depict the home range, territory or dispersal patterns of individual Algonquin wolves. The extent of occurrence is therefore a conservative estimate of the Algonquin wolf’s true range or habitat. The average minimum (straight-line) distance that an Algonquin wolf travels from its natal pack is 32km (Patterson pers. comm.). There have been two recorded Algonquin wolves (Patterson pers comm. & COSSARO 2016) in areas very far from Algonquin Provincial Park, the presumed source of the population (Benson et al. 2013), providing clear evidence that at least some Algonquin wolves travel hundreds of kilometers in search of mates, territory, and/or prey. In addition, the extensive travel of some wolves, often referred to as “dispersers”, may be essential for maintaining genetic diversity and thus integrity. e. The proposed closures are too small and disconnected to protect individual Algonquin wolves throughout their life cycle. Dispersal is a process inherent to the animals’ survival and recovery through establishment in new areas; without this ability to disperse and recover, there will be a significant adverse effect on the species. Moreover, it is unlikely that viable wolf populations can be supported in such a small area (Theberge 1991). The proposed closures are largely disconnected from one another and from Algonquin Provincial Park, except for a narrow corridor connecting the Algonquin panhandle to the closures proposed north of Kawartha Highlands Signature Site. Provincially funded research showing satellite-tracked movements of confirmed Algonquin wolves has provided clear evidence that wolves living in the areas where the closures have been proposed are not restricted to the closed season boundaries. It is important to recognize the possibility that outside of APP, Algonquin wolf clusters around KP, KHSS and QEIIW are not viable to begin with. (Benson, Wheeldon and Patterson, 2012). Given the high risk of Algonquin wolf mortality due to hunting and trapping outside of protected areas (Benson 2013), it is alarming that the government would knowingly jeopardize the survival of individuals that cross the proposed closure areas; these closures are biologically and ecologically meaningless to wolves and coyotes. Regardless of the biologically flawed definition of “core occurrence areas”, it remains that the Endangered Species Act was created with the intent of recovering species facing high risk of extinction, and this proposal insinuates that all wolves, coyotes and wild canid hybrids occurring outside of these three proposed closures are not worth protecting. This is completely unacceptable given the rarity of the Algonquin wolf, population size, substantial evidence showing that hunting and trapping are the primary threats to the species, and ecological and inherent value of all species, sub-species and hybrids. i. Ontario previously defined a “core wolf range” where small game licence holders can purchase up to two wolf/coyote game seals per year for use between September 15th and March 31st, and mandatory reporting averages approximately 60% (Stuart pers comm.). To begin, the government does not have sufficient numbers of conservation officers to enforce these restrictions. Secondly, the low reporting rate of data required by hunters holding wolf/coyotes seals (data which we emphasize is not necessarily accurate, as it is collected by special interest groups and is at best, anecdotal given that coyotes and wolves cannot be identified using visual cues, and the surveying consistency between hunters has not be analyzed) appears to be without consequence. Hunters who do not report their take should be denied a licence the following year, as trappers are denied access to traplines when they do not report their take. MNRF must hold each hunter licensed under the FWCA accountable to the regulations. There are no trapping bag limits and trapping data is compiled provincially without finer scale analysis (Stuart pers comm.) which is required to determine the amount of trapping occurring within the Algonquin wolf’s extent of occurrence. Like hunters, trappers are unable to differentiate between Algonquin wolves, coyotes or their hybrids and are therefore unable to accurately report how many of each species they have killed. However, MNRF still required trappers to differentiate between “wolf” and “coyote” which is extremely inconsistent. That MNRF does not require genetic assignment testing of commercially sold pelts is alarming and leaves room for further exploitation of a species which is supposed to be protected by law. ii. In southern Ontario, coyote/wolf hunting and trapping are permitted year-round without bag limits or mandatory reporting requirements. The extent of occurrence of Algonquin wolves includes areas under this management regime. Absolutely no information has been obtained by the government to quantify the probability of wolves dispersing south into habitat identified as historical range by the Committee on the Status of Species At Risk In Canada (COSEWIC) and currently available in the Adirondack region (COSEWIC 2015). This is antiquated, unethical and scientifically unsound management; coyotes and wolves in southern Ontario receive no protection, not even during periods of the year when they are nursing and raising their young. Thousands of animals are killed every year under the pretence of “population control” which research continues to show to be ineffective, unnecessary and which can exacerbate conflicts such as livestock depredation (Wielgus and Peebles 2014. Musiani, M. and P. Paquet 2004). It is very concerning that for many years ongoing killing of at-risk Algonquin wolves, across their extent of occurrence, has barely been quantified or mitigated. Algonquin wolf populations would likely be unviable within the proposed closures, which are insufficient at protecting even individual wolves throughout their life cycle. To increase the probability that Algonquin wolves recover, all wolf and coyote killing in the above mentioned WMUs must be banned under the FWCA, in line with the intent of the protection provisions outlined in s. 9 of the Endangered Species Act. While these three closures are marketed as an interim strategy as we await the Ontario government’s Recovery Strategy and Response Statement, we would like to take this opportunity to remind MNRF that a Management Plan has been overdue since 2008, as mandated by the Endangered Species Act and federal Species At Risk Act since the wolves’ listing as a species of Special Concern. Furthermore, these proposals ignore the vast majority of Algonquin wolf research that has been undertaken by experts. Ignoring the science at the behest of the profits made by hunters and trappers is an abysmal waste of the money that supports the wildlife research division, as well as the time, energy and skills that numerous biologists have dedicated to the study of Ontario’s wild canids. The province of Ontario released then-progressive provincial wolf and black bear conservation strategies in 2005, recognizing that large carnivores are ecologically and inherently invaluable and irreplaceable. A provincial coyote conservation strategy is long overdue, and we urge the MNRF to prioritize the conservation of all canids alongside the implementation of meaningful regulatory changes that will stand a real chance at recovering at-risk Algonquin wolves. Benson. 2013. Hybridization dynamics between wolves and coyotes in central Ontario. PhD Thesis. Benson and Patterson. 2013. Inter‑specific territoriality in a Canis hybrid zone: spatial segregation between wolves, coyotes, and hybrids. Oecologia 172 p. 1539-1550. Benson, Patterson, Mahoney. 2014 A protected area influence genotype-specific survival and the structure of a Canis hybrid zone. Ecology 95, p. 254-264. Benson, Wheeldon, Patterson. 2012. Spatial genetic and morphologic structure of wolves and coyotes in relation to environmental heterogeneity in a Canis hybrid zone. Molecular Ecology 21, 5934-5954. Brainerd, Andren, Bangs, Bradley, Fontaine, Hall, Iliopoulos, Jimenez, Jozwiak, Liberg. 2008. The effects of breeder loss on wolves. Journal of Wildlife Management 72, 89–98. Chapron, Andren and Liberg. 2008. Conserving top predators in ecosystems. Science 320, 47. COSEWIC. 2015. COSEWIC assessment and status report on the Eastern Wolf Canis sp. cf. lycaon in Canada. Committee on the Status of Endangered Wildlife in Canada. Ottawa. xii + 67 pp. (www.registrelep sararegistry.gc.ca/default_e.cfm). Darimont, Carlson, Kinnison, Paquet, Reimchen, Wilmers. 2009. Human predators outpace other agents of trait change in the wild. Proceedings of the National Academy of Sciences USA 106, 952–954. Grant, Grant, Petren. 2005. Hybridization in the recent past. American Naturalist 166, 56–67. Musiani, Paquet. 2004. The Practices of Wolf Persecution, Protection, and Restoration in Canada and the United States. BioScience 54, 50-60. Rutledge, White, Row, and Patterson. 2011. Intense harvesting of eastern wolves facilitated hybridization with coyotes. Ecology and Evolution 2, 19-33. Rutledge, Garroway, Loveless, and Patterson. 2010a. Genetic differentiation of eastern wolves in Algonquin Park despite bridging gene flow between coyotes and grey wolves. Heredity 105, 520-531. Rutledge, Patterson, Mills, Loveless, Murray, and White. 2010b. Protection from harvesting restores the natural social structure of eastern wolf packs. Biological Conservation 143, 332-339. Sand, Wikenros, Wabakken, Liberg. 2006. Effects of hunting group size, snow depth and age on the success of wolves hunting moose. Animal Behavior 72, 781. Schmidt, Je˛drzejewski, Theuerkauf, Kowalczyk, Okarma, Je˛drzejewska. 2008. Reproductive behaviour of wild-living wolves in Bialowieza Primeval Forest (Poland). Journal of Ethology 26, 69–78. Sears, Theberge, Theberge, Thornton, and Campbell 2003. Landscape influence on Canis morphological and ecological variation in a coyote–wolf C. lupus x latrans hybrid zone, southeastern Ontario. Canadian Field-Naturalist 117, 589–600. Smith, Ferguson. 2005. Decade of the Wolf: Returning the Wild to Yellowstone. The Lyons Press, Guilford, CT.
Soule, Estes, Berger, Martinez del Rio. 2003. Ecological effectiveness: conservation goals for interactive species. Conservation Biology 17, 1238–1250. Stahler, Smith, Guernsey. 2006. Foraging and feeding ecology of the gray wolf (Canis lupus): lessons from yellowstone national park, Wyoming, USA. Journal of Nutrition 36, 1923S. Terborgh, Lopez, Nunez, Rao, Shahabuddin, Orihuela, Riveros, Ascanio, Adler, Lambert, Balbas. 2001. Ecological meltdown in predator-free forest fragments. Science 294, 1923–1926. Theberge. 1991. Ecological classification, status, and management of the Gray wolf, Canis lupus, in Canada. Canadian Field Naturalist 105, 459-463. Theberge, Theberge, 2004. The Wolves of Algonquin Park: A 12 year Ecological Study. Department of Geography, University of Waterloo, Waterloo, Ontario, Canada. Theberge, Theberge, Vucetich, Paquet. 2006. Pitfalls of applying adaptive management to a wolf population in Algonquin Provincial Park, Ontario. Environmental Management 37, 451–460. Wielgus, Peebles, 2014 Effects of Wolf Mortality on Livestock Depredations. PLoSONE 9. Wilson, Grewal, Lawford, Heal, Granacki, Pennock, Theberge, Theberge, Voigt, Waddell, Chambers, Paquet, Goulet, Cluff and White. 2000. DNA profiles of the eastern Canadian wolf and the red wolf provide evidence for a common evolutionary history independent of the gray wolf. Canadian Journal of Zoology 78, 2156 – 2166. VonHoldt, Stahler, Smith, Earl, Pollinger, Wayne. 2008. The genealogy and genetic viability of reintroduced Yellowstone grey wolves. Molecular Ecology 17, 252–274. See: Rare Wolf or Common Coyote? It Shouldn’t Matter, but it Does. Smithsonian Magazine, August 3 2016. TORONTO – On June 15th, 2016, the Ontario Ministry of Natural Resources and Forestry (MNRF) announced that Canada’s rarest wolf faces a higher risk of extinction than previously thought. Now named ‘Algonquin Wolves’, after their stronghold population in Algonquin Provincial Park, the wolves were upgraded from Special Concern to Threatened status in Ontario. A Management Plan, legally mandated for Special Concern status, has been overdue since 2008. Under Ontario’s Endangered Species Act, Threatened status affords the wolves and their habitat immediate and automatic protection from harvest. However, under existing regulations, the wolves will continue to be killed in unknown numbers in legal wolf/coyote open seasons. As the last representatives of the once wide ranging Eastern Wolf species, Algonquin wolves have been found infrequently across central Ontario and western Quebec, numbering somewhere between 250 and 1000 animals. Naïve to the risks associated with humans – hunting, trapping and vehicle collisions – the animals’ survival is low outside of protected areas. MNRF’s own research shows that without more protection in Ontario, where most of the wolves are found, recovery is virtually impossible. “Ontario set a terrific conservation precedent when wolf and coyote killing was permanently banned in a buffer zone made up of all townships adjacent to Algonquin Park in 2004,” says Hannah Barron of Earthroots. She adds, “To recover this rare wolf, hunting and trapping wolves and coyotes must be immediately prohibited beyond the buffer zone, across the full range of Algonquin wolves. They also require a Recovery Strategy now that their at-risk status has deteriorated.” She notes that the buffer zone had the added benefit of maintaining the genetic integrity of Algonquin wolves, which is diluted when the wolves interbreed with eastern coyotes. Moose are declining at an alarming rate in many jurisdictions such as Ontario, Manitoba, Minnesota and Montana. Many of those areas have prohibited moose harvesting while they investigate the reasons behind the declines. Ontario needs to build on its commitment to change hunting regulations, manage resource extraction and development to limit impacts on wolf-moose-caribou dynamics and plan for the long-term effects of climate change. MNRF currently collects data on wolf/coyote sightings and hunting effort, which helps to clarify moose-predator dynamics. Part of the proposed regulation changes are to remove the mandatory game “seal” reporting requirements for coyote and wolf hunters in Central and Northern Ontario. This reduction in research effort clearly demonstrates the MNRF’s lack of commitment to determine the true cause of moose declines. The Ministry has no scientific evidence showing that encouraging hunters to kill wolves and coyotes will benefit moose. In fact, the Moose Project website summarizes scientific research that suggests the opposite. Moreover, there is strong evidence from Central Ontario that hunting pressure increases moose deaths, instead of compensating for deaths from predation and natural causes. Ontario’s moose are managed under the compensatory framework. Clearly moose harvest policy must be changed to reflect this new knowledge. The BC and Alberta governments are currently attempting to exterminate wolves in endangered caribou habitat, yet the caribou populations are not increasing. Once again, government encouragement of predator control as a band-aid solution to the larger problem of declining prey species fails at the expense of thousands of wolves. Wolf and coyote seals cost a mere $11.14 for Ontario residents and are currently limited to 2/hunter/year. At a very small cost to individual hunters, the MNRF collects badly needed funds that help them carry out essential research and management enforcement. This proposal perpetuates the under-funding of MNRF by removing the wolf/coyote seal once required across all of Central and Northern Ontario. Without adequate funding, MNRF researchers will be unable to identify the reasons behind moose declines. By encouraging hunters to kill as many coyotes as they want in Northern Ontario, this proposal worsens the already medieval management of the species. It is time these animals are managed with more compassion and respect for their ecological contribution to Ontario’s diverse landscapes. Eastern coyotes are fascinating examples of evolution. Arriving in Ontario in the early 1900s, they bred with remnant eastern wolves and became incredibly well-adapted to a variety of habitats. Following the systematic extermination of wolves in Southern Ontario during European settlement, rodent and deer populations became hyperabundant and have cost millions in crop devastation. Described as wily, wolf-like vermin, the eastern coyote’s ability to fill the role of top predator in areas dominated by people is actually a blessing. Coyotes are now the only predator capable of controlling deer in Ontario’s populated areas – deer culling would not be necessary in areas with a coyote population protected from harvesting. However, coyotes are still slaughtered to prevent livestock depredation in most of the province. MNRF and the Ontario Ministry of Agriculture, Food and Rural Affairs (OMAFRA) support these actions, ignoring science that shows coyotes populations are next to impossible to control, that non-lethal predator management can successfully mitigate livestock losses and that attempts to control coyote populations likely exacerbate livestock losses. Wolves and coyotes evolved alongside wild prey that are considerably harder to catch than livestock such as newborn calves and fearless, fenced-in sheep. By killing members of a coyote family, hunters splinter the tight pack structure that allows coyotes to take down larger prey like white-tailed deer. As such, fragmented coyote packs might be more of a threat to livestock than coyotes that are left alone by hunters. Coyotes and wolves dispersing south are never safe from hunters in Southern Ontario under existing legislation. Whole pack families can be destroyed as they nurse and raise newborn pups each spring. On December 8th 2015, The Committee on the Status of Species at Risk in Ontario (COSSARO) voted on the re-assessment of eastern wolves. COSSARO was expected to follow the lead of their sister committee in Canada and reclassify the animals as a unique species at a higher risk of extinction – up from “Special Concern” to “Threatened” or “Endangered”. Either of these levels would automatically and immediately protect Ontario’s eastern wolves. Typically, COSSARO notifies MNRF about their decisions on December 31st, half-way through the commenting period for this proposal. MNRF’s own research shows that there are eastern wolves in various parts of Central Ontario, well outside their stronghold (and only fully protected habitat) in and around Algonquin Provincial Park. The research also shows that compared to coyotes and hybrids, eastern wolves are the most likely to die outside of protected areas. Researchers have consistently claimed that the recovery of the species is virtually impossible if hunting and trapping seasons remain open in Central Ontario. With this proposal, MNRF suggests new canine management boundaries to mitigate threats to this at-risk species. However, hunters will still be allowed to shoot up to 2 wolves/coyotes in eastern wolf range, and will no longer be required to report on their hunting activity. Without genetic testing, no one can distinguish between coyotes, eastern wolves or their hybrids in Ontario. The government admits that they have no way of determining how many eastern wolves hunters or trappers are killing each year across the province. This is completely unacceptable. Ontario’s eastern wolves are a species of Special Concern. Scientists estimate that there are fewer than 500 individuals left, so why are they not better protected? Eastern wolves residing in Algonquin Provincial Park and its adjacent townships have year-round protection from hunting and trapping. But wolves outside of those areas are not so lucky. With the exception of Algonquin Park, trappers are permitted to harvest eastern wolves in all provincial parks and conservation reserves. Hybridization with coyotes also threatens the wolves. And since eastern wolves can only be distinguished from eastern coyotes through genetic analysis, hunters targeting coyotes can unwittingly kill wolves instead. Given the threats this species at risk faces, why does the killing continue? This year, the Committee on the Status of Endangered Wildlife in Canada (COSEWIC) recommended that the Minister of Environment up list eastern wolves to Threatened. Under the Species at Risk Act (SARA), this change in their legal status would require the release of a ‘recovery strategy’ within 2 years. In response to the growing backlog of species waiting to be listed and protected with a conservation plan by the Minister, Environment Canada published a realistic timeline for the release of overdue management and recovery strategies. Unless Minister McKenna, the new Minister of Environment, is better able to address the at-risk dilemma, we should not expect the release of the mandated ‘management plan’ until 2017 – a staggering 9 years late. If the management plan is 9 years late, how late will a recovery plan be? The silver lining on this cloud is that the Committee on the Status of Species at Risk in Ontario (COSSARO) will assess the eastern wolf during their winter meeting on December 9-10th, 2015. Hopefully, COSSARO’s assessment will lead to protective measures. In the meantime, what fate awaits other species whose listing status changes during the time it takes for the Canadian government to address the growing number of species at risk? When it comes to wildlife at risk, we do not have the luxury of time to waste. On August 12th, the Ministry of Natural Resources and Forestry proposed an amendment to the regulations that govern trapping in Ontario. Ministry biologists and a trapper conducted an experimental capture of coyotes using new devices called “relaxing cable restraints”. The results showed that of 20 animals trapped, 17 were coyotes. The three others were a domestic dog caught around the neck, and a white tailed deer and raccoon both caught around the torso; they were released by the trapper, apparently unharmed. Injuries to coyotes were assessed after each animal was shot in the head by the trapper and submitted to a veterinary pathologist. Six coyotes were submitted skinned, the trapper having sold their pelt for profit. Injuries were deemed acceptable according to the Agreement on the International Humane Trapping Standards but were gruesome: including one coyote who suffered several injuries having tried to chew himself out of the trap and many instances of lacerations on the neck. Three traps were chewed through entirely and one was dragged away, likely having captured a large animal such as a bear or an adult deer. Earthroots does not believe that these results show that relaxing cable restraints are selective. Instead, they appear to pose a serious threat to non-target animals. Despite the Ministry’s reasoning that these traps are more selective than killing snares, the point remains that the Ontario government condones killing coyotes and other wildlife deemed as a threat or nuisance, instead of educating the public to prevent conflict in the first place. Not only is harming and killing wildlife ethically bankrupt, science shows that it does not reduce and can actually exacerbate livestock depredation. Furthermore, legalizing this trapping device would give trappers false confidence in trap selectivity for coyotes. Given that eastern wolves and coyotes are physically indistinguishable in Ontario, the unintentional trapping and killing of eastern wolves is possible where their ranges overlap. The government knowingly endangers eastern wolves, a species at risk of extinction, by supporting this trapping device and the use of trapping in general as a response to perceived threats from wildlife. In collaboration with several other conservation organizations, Earthroots authored a comment in opposition to this proposal addressing the fundamental flaws in the arguments for trapping and killing wildlife in Ontario. You can read our public comment below. Sign up as a Wolf Defender and we’ll let you know about government proposals like these and provide information about how to exercise your right to comment on legislative changes. Use your voice to speak up for wildlife! Thank you for this opportunity to comment on the proposed changes to trapping regulations in Ontario. We acknowledge the Ontario Ministry of Natural Resources and Forestry’s (MNRF) attempt to mitigate the effects of trapping on non-target species by testing the relaxed cable restraint device (RCR). However, we are concerned that the proposed changes made under the Fish and Wildlife Conservation Act (FWCA) do not provide such a solution. We outline these concerns below and provide recommendations to address the underlying reason for the proposed regulation changes. There is little to no evidence in the scientific literature that supports the use of lethal control/removal of canids as an effective, long-term tool for reducing livestock depredation. Trappers and farmers permitted to use trapping devices to capture coyotes and wolves in defense of property do not often have access to the scientific literature that addresses predator control. They often lack the best available information about mitigating livestock depredation. We suggest that MNRF focus on equipping farmers and trappers with this information in order to help reduce conflict between predators and farmers. Harper et al. (2008) and Wielgus & Peebles (2014) found no evidence that removal of wolves decreased the rate of depredation the following year, in Minnesota and Idaho, Wyoming and Montana, respectively, unless the population was harvested at an unsustainable rate. In fact, both studies found that livestock depredation increased the following year. Wallach et al. (2009) found that lethal control of dingoes in Australia did not necessarily reduce abundance of the predator and led to socially fractured populations. They add that socially unstable predator populations are often correlated with higher livestock losses, a result echoed by Allen and Gonzalez (1997, dingoes in Australia), Conner et al. (1998; coyotes in the USA) and Peebles et al. (2013, cougars in the USA). Ongoing harvesting of canids to reduce their population to near-zero in order to reduce livestock depredation risk is both ecologically and socially unacceptable. Coyotes and wolves provide useful ecosystem services to farmers such as controlling rodent and deer populations and are inherently valuable and deserving of protection from systematic eradication. Selective removal of problem/breeding coyotes is both difficult and ecologically complex (Conner et al. 2007) and appears to reduce depredation for only a very short period of time (see review in Jaeger 2004). There exists a wide variety of methods to prevent livestock depredation by wolves and coyotes including but not limited to: removing deadstock quickly and reducing other open attractants, confining or concentrating livestock during periods of high vulnerability (e.g. calving/lambing), using livestock guardian animals (e.g. dogs, llamas, donkeys etc. ), maintaining a human presence in areas of the property where animals are pastured using deterrents such as fladry, turbofladry and sound/light deterrents. When used correctly and adaptively, these tools can be combined on a case-by-case basis to effectively reduce livestock depredation and replace lethal predator management altogether. For example, Harper et al. (2008) analyzed lethal management by trapping in particular, and suggested that daily visits simulating trapping may be a more cost effective tool than actually trapping wolves. Educate farmers in wolf/coyote range about non-lethal predator management to complement the existing livestock compensation program. Transition from the reactionary trapping and the compensation program administered by the Livestock, Poultry and Honeybee Protection Act to the prevention of livestock depredation by providing financial incentives to farmers who adopt non-lethal predator management approaches. Coyote trapping in many areas of southern and central Ontario continues to threaten the survival and dispersal of eastern wolves (Canis lycaon), a species at risk. Anthropogenic mortality is a threat to eastern wolves. Eastern wolf survival is lower than that of other canis types outside of the protected area in and around Algonquin Provincial Park (APP). Hybridization is a threat to eastern wolves. Hybridization with coyotes is higher in areas where canids are harvested. Eastern wolves are not likely to recover outside of APP to their historical range without protection from harvest. Eastern wolves and the coyotes that inhabit Ontario are physically indistinguishable – without genetic testing, you cannot differentiate between a pure eastern wolf and a coyote or a hybrid. Eastern wolves and other canis types have overlapping body sizes. MNRF is uncertain about the current and historical range of the eastern wolf in Ontario. It follows that eastern wolves are very likely caught in traps laid for coyotes. Furthermore, since a trapper or farmer is unable to differentiate between a coyote and an eastern wolf, they may be killing eastern wolves unintentionally. The relaxed cable restraint (RCR) will not protect eastern wolves despite MNRF’s intent to reduce non-target species mortality and endangers this species at risk. The federal and provincial status of the eastern wolf therefore precludes the use of RCR or any other coyote trapping device in suspected, known and historic eastern wolf range while the species is threatened with extinction. Immediately prohibit all wolf/coyote trapping in known and suspected eastern wolf range. Incorporate direction for non-lethal, preventative predator management of both wolves and coyotes for farmers into the Strategy for Wolf Conservation in Ontario and the FWCA. We strongly urge you to adopt our recommendations and ensure that famers are protected from the economic costs of maintaining healthy, resilient and socially stable canid predator populations in Ontario. Allen L and Gonzales T.1998. Baiting reduces dingo numbers, changes age structure yet often increases calf losses. Australian Vertebrate Pest Control Conference 11:421–428. Conner MM, Jaeger MM, Weller TJ and McCullough DR. 1998. Effect of coyote removal on sheep depredation in northern California. Journal of Wildlife Management 62:690–699. Conner MM, MR Ebinger and FF Knowlton. 2008. Evaluating coyote management strategies using a spatially explicit, individual-based, socially structured population model. Ecological Modelling 219: 234-247. Harper E, Williams PH, Mech LD and Wiesberg S. 2008. Effectiveness of lethal, directed wolf-depredation control in Minnesota. The Journal of Wildlife Management 72:778-783. Jeager MM. 2004. Selective targeting of Alpha coyotes to stop sheep depredation. Sheep and Goat Research Journal, Paper 9. Knowlton, FF, EM Gese and MM Jaeger. 1998. Coyote depredation control: An interface between biology and management. Journal of Range Management, 52, 398-412. Peebles KA, Wielgus RB, Maletzke BT and Swanson ME (2013) Effects of remedial sport hunting on cougar complaints and livestock depredations. PLoS ONE. Rutledge LY, Devillard S, Boone JQ, Hohenlohe PA and White BN. 2015 RAD sequencing and genomic simulations resolve hybrid origins within North American Canis. Biology Letters. 11: 20150303. Wallach AD, Ritchie EG, Read J and O’Neill AJ. 2009. More than Mere Numbers: The Impact of Lethal Control on the Social Stability of a Top-Order Predator. PLoS ONE 24. Wielgus RB and Peebles KA. 2014. Effects of wolf mortality on livestock depredation. PLoS ONE 9(12): e113505. Ontario’s Moose Project: A Death Sentence for Wolves? The Ontario Government has begun Phase 2 of the Moose Project. In response to recent moose declines in some areas of Ontario and many other jurisdictions in North American, the government has proposed changes to the moose hunting season, and is consulting the public about other possible factors in the decline of Ontario’s moose. Not surprisingly, many people who profit from killing moose have been lobbying the government to reduce hard-won protection for wolves. An alarming amount of wolves are already killed in the more accessible parts of Ontario. - Removing the 2 wolves/hunter bag limit would exacerbate the unsustainable harvest of wolves in those areas. - Opening up the closed season in core wolf range endangers wolf families when they are most vulnerable – when they are rearing their pups. Wolves and other predators are being scapegoated for the moose declines. Help ensure the government considers the full range of management options and does not condone the slaughter of more wolves for the sake of moose hunters – submit your comments in opposition to predator control at mooseproject@ontario.ca. Sign up as a Wolf Defender and become engaged as the Moose Project unfolds. Following over two years of deliberation, the federal Committee on the Status of Endangered Wildlife in Canada (COSEWIC) announced that the at-risk status of eastern wolves has worsened. On May 4, 2015 COSEWIC released their decision to assign the eastern wolf, now considered a unique species (Canis c.f. lycaon), threatened status in Canada. Prior to this latest decision, eastern wolves were designated a grey wolf subspecies of ‘special concern‘ in 2001. The management plan required for species of special concern under Canada’s Species at Risk Act (SARA) has been overdue since 2008. SARA requires that a recovery plan be released within 2 years of a species being listed as threatened. The public will have the opportunity to comment on the proposed recovery strategy. Currently, both provincial committees on species at risk in Ontario (COSSARO) and Quebec are unable to assess the status of eastern wolves as a unique species due to lack of members and budget cuts, respectively. Sign up as a Wolf Defender to learn about ways you can help ensure eastern wolves gain increased protection despite these obstacles. Read COSEWIC’s press release here. Earthroots is eagerly awaiting the results from the federal Committee on the Status of Endangered Wildlife in Canada’s (COSEWIC) re-assessment of the eastern wolf’s at-risk status. COSEWIC is currently meeting in Quebec City for the first of its 2015 meetings. As of 2001, eastern wolves (Canis lycaon) were listed as a grey wolf subspecies of special concern. Since this assessment, researchers discovered that eastern wolves are a unique wolf species occurring only in Canada, and are closely related to the endangered red wolf in the United States. The Ontario Ministry of Natural Resources estimated that the total population does not exceed 500 individuals. However, a management plan (legally required under the federal Species at Risk Act (SARA) within three years of a species being designated ‘special concern’) was never released. In 2014, Environment Canada published a 3-year plan that outlines the timelines for release of all overdue recovery documents, including recovery documents for the eastern wolf in 2016-1017. Earthroots originally applied to the Ontario Ministry of Natural Resources to provincially re-assess the eastern wolf in 2010. The government denied the application, citing that COSEWIC was already reviewing the population. The federal assessment is only now being released, five years later. The provincial assessment will likely match the federal designation, and is expected to be released by the Committee on the Status of Species at Risk in Ontario in Spring, 2015. In Ontario, eastern wolves are only fully protected from hunting and trapping in and around Algonquin Provincial Park. However, the latest research contributed by OMNR biologists reveals that eastern wolves are prone to being trapped, hunted and killed by vehicle collisions outside of their protection zone. Earthroots urges the provincial government to immediately expand full protection from harvest to both eastern wolves and the indistinguishable eastern coyote in all suspected eastern wolf range, including the Frontenac Axis that joins the Algonquin and Adirondacks protected complexes. (Toronto) Earthroots congratulates Minister of Natural Resources, David Ramsay, who today announced his decision to improve the conservation of wolves across the province. The Minister will regulate the recreational hunting of wolves by limiting the number each properly licensed hunter can shoot to two per year. Effective September 15th, hunters who want to shoot wolves, must now purchase a special wolf seal. Ontario hunters will have to pay $10 for the seal but non-residents will have to pay $250. Earthroots hopes this will lead to an end to sport hunting wolves; an activity that Americans are predominantly participating in. The Minister is also making it mandatory to report all wolves killed regardless of the method and reason. Earthroots welcomes the new regulatory improvements calling today’s decision a good first step but says more work still needs to be done to protect wolves and their habitat. Wolves are only protected on 3% of their range in the province, while 97% is still open to hunting and trapping. Only a few parks are off-limits to hunters and trappers and large enough to sustain a viable wolf population. Ontario had long been recognized as one of the worst jurisdictions in the world for its exploitative wolf management policies. Up until this year, wolves were treated as vermin and could be killed 365 days of the year without any limitations. This is the first time in the history of Ontario, that there are restrictions on killing wolves across the majority of their provincial range. There is still no limit on the number of wolves each trapper can kill. Earthroots says between 500-600 wolves are trapped every year for the commercial sale of their pelts. The majority of wolves are caught in strangling neck snares, which Earthroots calls ‘a cruel and non-selective’ trap. How many wolf species are there in North America? Are we acting on wolves or are they acting on us too?